An Aberdeenshire cattle breeder is cashing in on the nation’s love of Highland cattle. 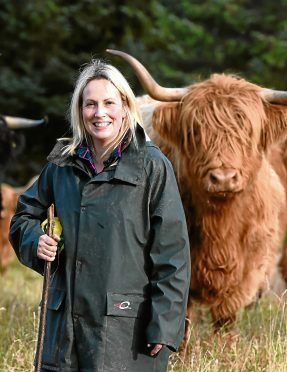 Grace Noble, who runs a herd of pure Highland cattle at Lochton Farm, near Banchory, launched an on-farm butchery last year. The meat from her business – Aberdeenshire Highland Beef – is now used by chefs in a range of restaurants, cafes and hotels across the north-east including The Chester Hotel in Aberdeen and the Rothesay Rooms in Ballater. And to meet a growing demand from domestic shoppers, she has now started running pop-up butchery shops at the farm every weekend from Friday to Sunday. “The butchery is going really well and I’m just starting to up my production to supply the growing market,” said Mrs Noble, who started farming five years ago after moving away from her career in environmental health. She said shoppers loved the story behind Highland beef. “There’s no mystery to the meat and the brand,” said Mrs Noble. Up to two cattle are killed every week at an abattoir off the farm, and the carcases are brought back to be hung for 28 days before being butchered on -site. All beef is sourced from 100% pure pedigree Highland cattle and Mrs Noble’s supply from her 40-cow herd is supplemented with bought-in stock from the Queen’s Balmoral herd. In future, Mrs Noble plans to develop a farm tourism heritage site at the farm, with support from her landlord – Leys Estate. The farm is already a busy tourist attraction, with around 1,000 Americans booked in to visit the farm, for a fee, between May and September next year. “It’s about bringing Banchory back to its roots – it’s a farming toon,” said Mrs Noble. The new tourism site, which is to be established next year, will educate visitors about farming and Highland cattle.